Recently on one of my salty travels I came across a product called Seachem De*Nitrate. Great I thought, I'll bung it in my external filter to try and get the nitrate levels down. 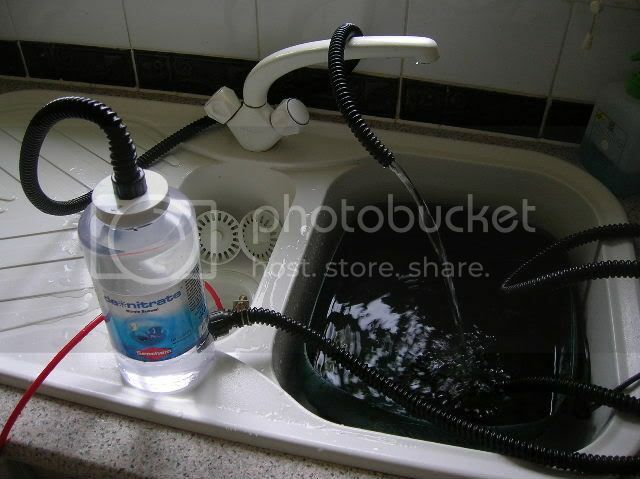 It wasn't until I had got it home and read the instructions properly that I realised that in order for the denitrate to function the flow rate through it must not exceed 200litres an hour. The external filter works at over three times this amount. I therefore toyed with the idea of turning the canister that the denitrate came in into a filter in its own right. Now you will have to excuse me but in my rush to get going I clean forgot about creating a diary of progress and so the filter was more or less finished by the time I thought about it. Also I am not very good at explaining this sort of thing so I apologise if its not very straight forward. 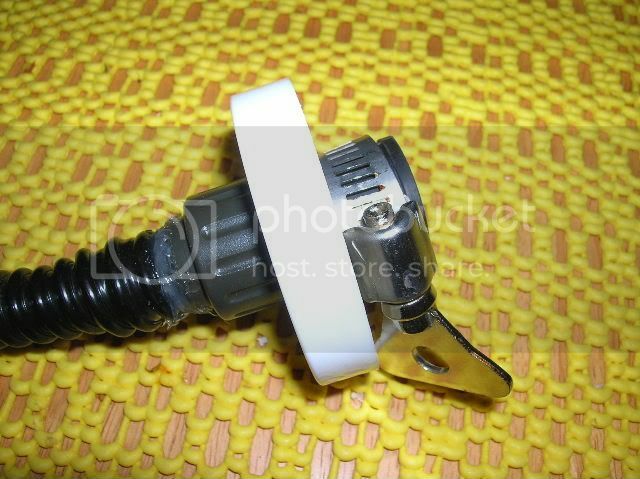 Basically I bought two garden hose tap connectors from B&Q. I removed the metal jubilee clips and then cut a 12mm hole in the lid of the canister. 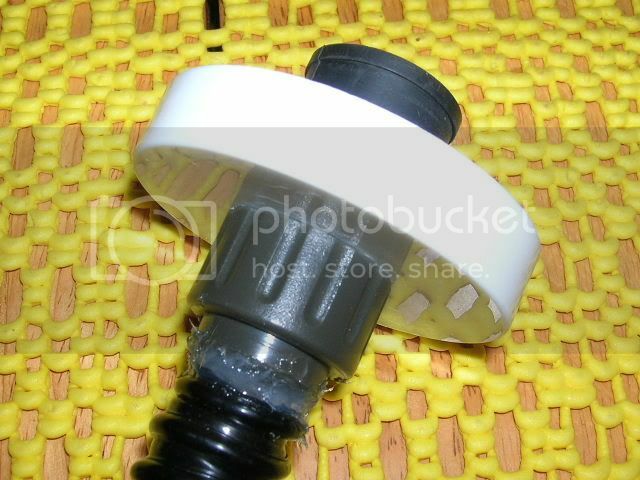 The tap connector was then attached to the lid and siliconed in place. I then did the same at the bottom side of the canister. I then attached some black ribbed piping to the connectors, again siliconing it in place. To power the filter I had a spare maxijet 400 available so I thought I would use this. I was wondering whether the powerhead would be too powerful but as it turned out due to the length of the hose it was just right. I timed the flow and it took 4 minutes to fill a 10 litre bucket so working it out it would take 80 minutes to shift 200 litres. Well within the denitrates limits. The freshwater test worked really well with no leaks so I am going to rig it up to my reef tank soon and let the De Nitrate granules do their work. Will let you know how it performs. so you suposed to just pour the whole thing into the filter? I forgot to explain that De*Nitrate is a granular filtration media that is highly porous allowing aerobic bacteria to colonise its outer surface and anaerobic bacteria to colonise its internal area. It is these anaerobic bacteria that will break down the nitrate. Looks good and a lot cheaper than the ones I have seen for sale, does it work then, have you got it running in the tank yet? This is very similar to a project I'm working on ATM, although I decided that I didn't want to bodge it so I bought myself one of the 10" filter housings from Ro-man, along with a 1/4" ball valve and check vavle. 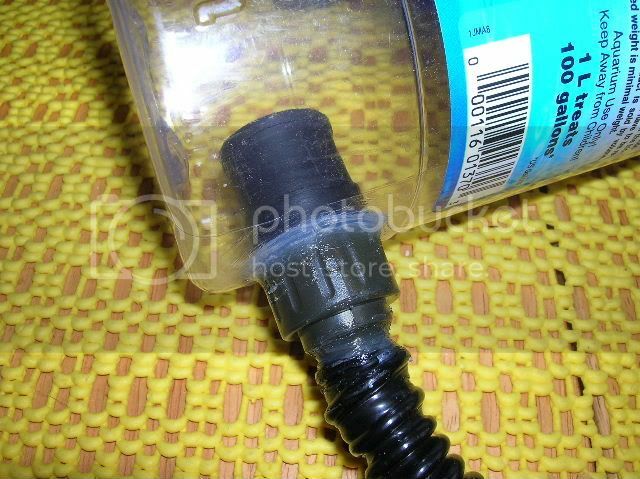 I plan to 'T' off the external filter and feed it off the backpressure from that. It will be a rowa phos reactor, the projects been halted though because I forgot to get some 1/4" connectors. Nice one. You taking orders now? how do you stop the balls going into the tank with the flow of water? SAY NO TO BI-ORB, keep reefkeeping ethical! The granules are quite heavy, and as the water flow is so slow they just stay where they are. Apparently so long as the initial nitrate load is under 20ppm the granules will never become exhausted. 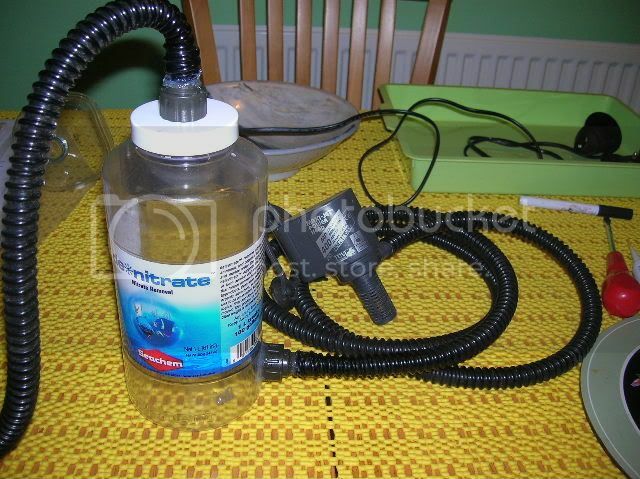 is the powerhead in your sump (if you have one) or main tank? Its in the main tank atm, but when I get the 'hang on' refugium I'll place it in there. looks like a spot on bit of DIY kit!